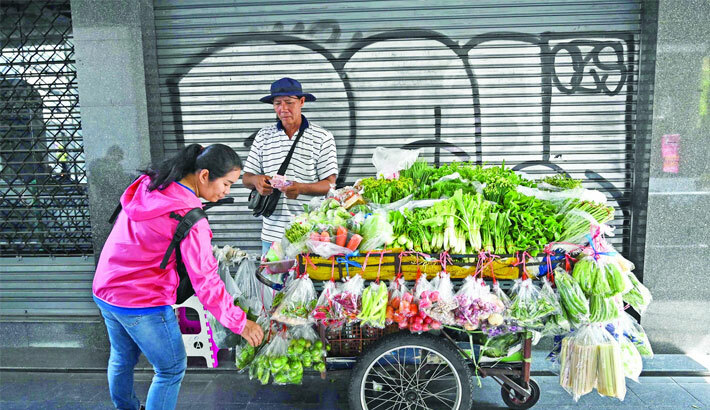 A vegetable vendor (back) attends a customer beside a street in Bangkok on Friday. BANGKOK: Thailand's export growth leaped 5.91 percent in February year on year due to the rising crude oil price and other factors, the Commerce Ministry said on Thursday. Exports of Thailand in February reached more than 21,550 million U.S. dollars and rose 5.91 percent after contracting for three consecutive months. In January, shipments contracted 5.65 percent from a year earlier, reports Xinhua. The depreciating Thai baht and the improving situations of human trafficking and labour in Thailand also contribute to the growth of shipment and have brought developed countries' confidence to Thai products.